For those who know me, I mean really know me, they know that for years I’ve had my head in books. Whether for college, grad school, theology, fun, or crafting. I love them! There’s just something about books that makes me happy. There’s something about reading that makes me happy too. In fact, not only do I have more than enough real books, I have over 200 on my Kindle right now as we speak. I generally read up to 4 books at a time: mostly sci-fi, fantasy, mystery, or period fiction. Over the 3 years or so that I’ve had my Kindle, it has become my best friend. And the fact that I can read from my app anywhere too … well, let’s just say I read a lot. It’s a hobby. It’s a pastime. And often it’s a compulsion. This being said, I have almost every book every published for polymer, going back all the way into the 1980’s when polymer first appeared & made it big in the American market. This being said, only the best polymer books make it to the “top shelf” right above where I clay. These books are my favorites. They are the ones I grab for inspiration. They are the ones that I never let out of my studio. So which polymer clay books are they? You’re about to find out! Here’s a brief synopsis of those books, who they are for, links to full reviews, & why they are there. Flourish: Flora – What a FANTASTIC book. It’s Christi’s newest and if you’re into “nature,” don’t miss out on this one. Please note that not all of Christi’s books are still available. Some are out of print. My favorite polymer clay book for reference, quick ideas, & color schemes is The Complete Books of Polymer Clay by Lisa Pavelka (Read my full review here). This is the main book that we will be using for those who are participating in the Pavelka Project. If you want to journey with us through this book, be sure to sign up now. I recommend this book for everyone. Polymer Clay Techniques Book by Sue Heaser – A great reference for new clayers – I recommend this book for everyone. Fairies, Gnomes, & Trolls by Maureen Carlson – Another of my all time favorites. If you like fantasy characters, you need this. – I recommend this book for everyone. Clay Characters for Kids by Maureen Carlson – This is a great idea resource & a lot of my students really like this one! – I recommend this for beginners. Polymer Clay Global Perspectives by Cynthia Tinapple – I recommend this book for everyone. Making Polymer Clay Beads by Carol Blackburn – A fantastic resource for bead-makers. Fantasy Creatures in Clay by Emily Coleman – Read my full review here – I recommend this book for everyone, but PLEASE read my review before purchasing. The Sculpey Way with Polymer Clay – To date this is still a favorite, just for the “cute” factor – I recommend this as an ideas resource or for beginners. Clay Characters 101 by Becky Maverden (I have the spiral bound version) – I recommend this for beginners & as an idea reference. 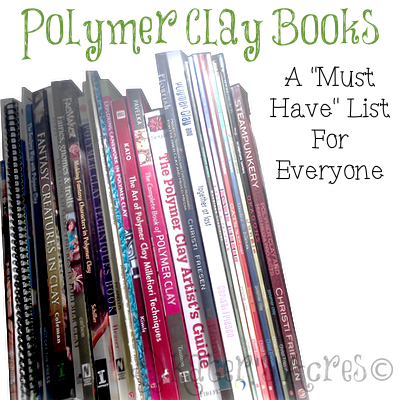 What Are Your Favorite Polymer Clay Books? Do you have a favorite polymer clay book? What is it & why is it your favorite? Let me know in the comments below! DISCLAIMER: Many links go to Amazon, where I am an affiliate.